i'm curious to see what you all are working on for the upcoming holiday! Nothing here, I want to make a R,W,B quilt but, not this year. I am working on a Dresden Plate quilt. Evenings and weekends. I have to pack and move between now and then so not much sewing. I just got a baby quilt back from the LAQ that I have to bind - but the shower is not until July 21st. Its my faborite holiday, even better than Christmas! I have Lazy Sunday, Sunshowers QAL (from last December, a little behind on that one),Pezzy Churndash and a log cabin going right now. But i will for sure be watching "Yankee Doodle Dandy" on TV...for the 457th time, i think! I put my little front door quilt out for July 1st (Canada Day). Last edited by Tartan; 06-06-2013 at 10:33 AM. That is so cute. Sew Sisters has some great Canadian fabric now. I made a string quilt in red, white and blue for the 4th. Just need to decide on border fabric. 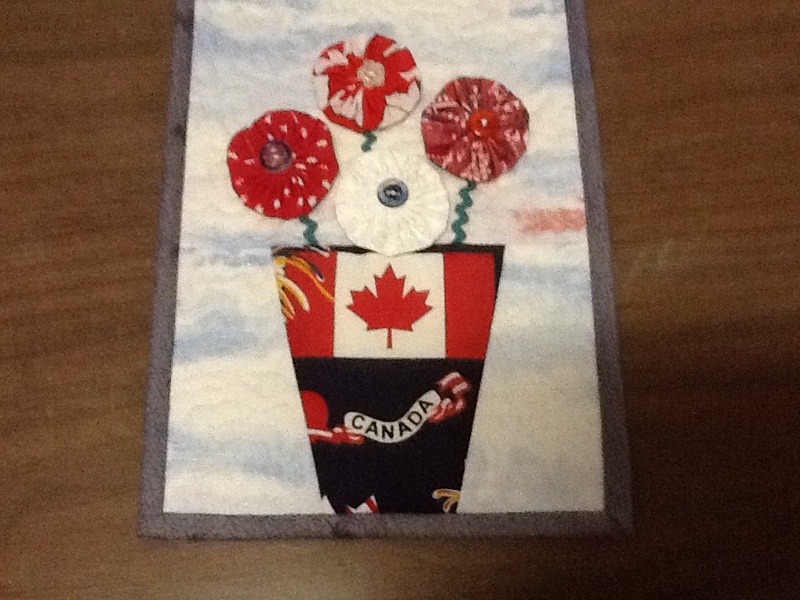 I am making Dresden plate table toppers in patriotic colors. Found the pattern on pinterest and fabric at Joanns. I used Marti Michells Kaleido-ruler, made several sizes in red, white, blue, yellow, and striped, left off the corners and appliqued the circles onto a dark blue background. If I could get my photos posted I would show it. I used it in the July TV program. No quilting for me! Hubby and I will be cruising through Glacier Bay on July 4th as part of a 2 week Alaskan cruise. I may bring some English Paper Piecing to work on if I need something to do. Need to make my list of quilt shops!